We all know that dogs possess an extraordinary sense of smell. So nothing makes more sense than to use this incredible talent in a sport (ITT - International Tracking Trials) that is both enjoyable for dog and owner! We always encourage handlers to maximise their dog's natural behaviour in training as much as possible, and this is where tracking plays an important role. 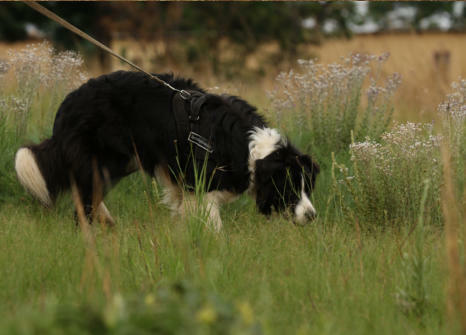 The dogs learn to follow a human scent trail, which increases in difficulty over the weeks. 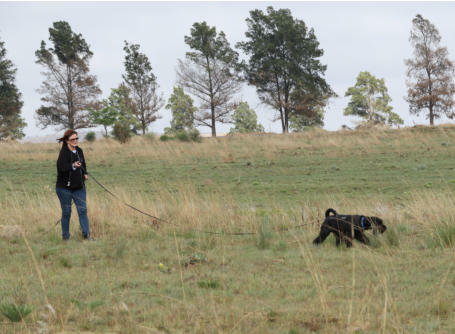 A positive reinforcement training method is used - the dogs really enjoy this activity, while the handlers learn to appreciate their dog's abilities. 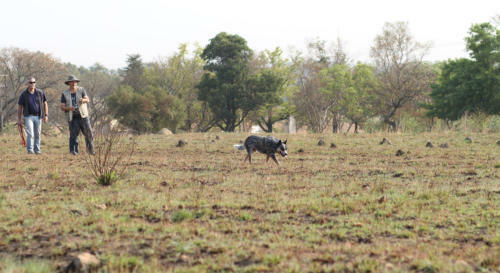 Apart from following the scent trail (which is aged) over various types of terrain the dogs also deal with corners and turns. 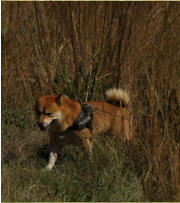 There are also articles which are dropped along the track, which the tracker dog indicates to their handler. All this makes tracking challenging but very enjoyable. Dogs must have a tracking harness before starting to track. 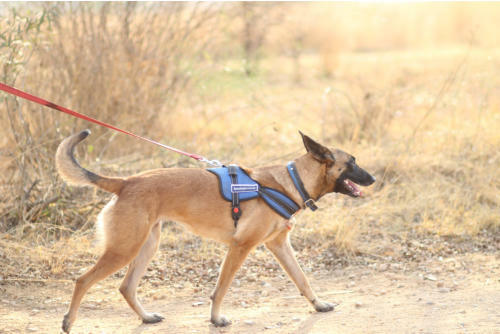 The harness encourages the dog to move forward and removes any pressure on the neck and throat. 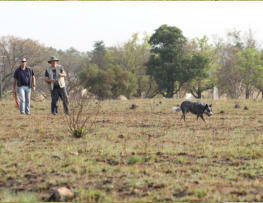 The McKaynine trackers meet on Saturday mornings at an open venue close to our Honeydew premises. 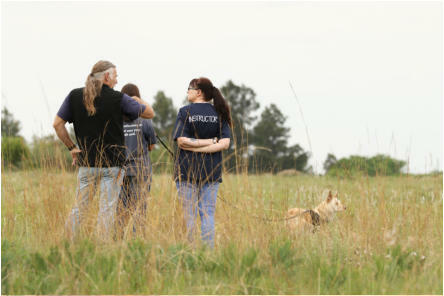 The team has achieved many qualifications under the tutelage of master tracker, Steve McClean, and we are exceptionally proud of our tracker dogs! A big thank you to Adri for the lovely photos! 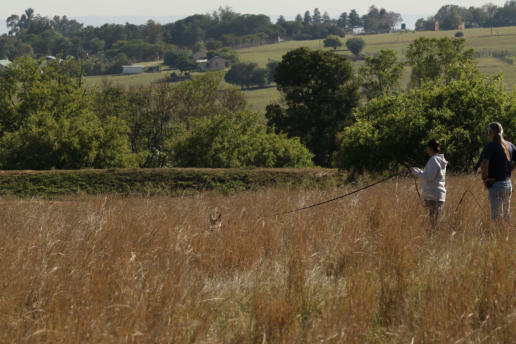 Our Tracking class is always fully booked, but we have a First Timer programme which you can enquire about. This programme allows you to fill in if a regular tracker is unable to make class. You can then decide if tracking is for you and go onto the waiting list - and then hope and pray that a permanent slot opens up soon! We wish we could accommodate all the requests we get for this class, but this would make the class too big for the type of personalised instruction that tracking requires. We all know that dogs possess an extraordinary sense of smell. So nothing makes more sense than to use this incredible talent in a sport (ITT - International Tracking Trials) that is both enjoyable for dog and owner! 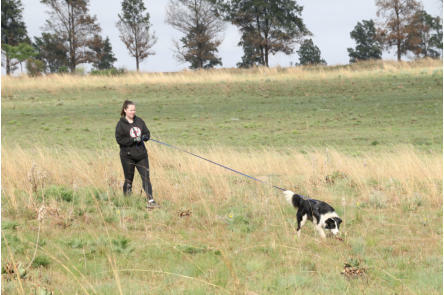 We always encourage handlers to maximise their dog's natural behaviour in training as much as possible, and this is where tracking plays an important role. 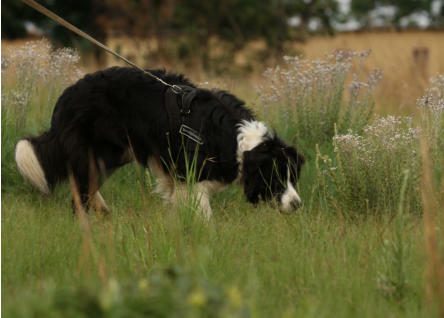 The dogs learn to follow a human scent trail, which increases in difficulty over the weeks. A positive reinforcement training method is used. Apart from following the scent trail (which is aged) over various types of terrain the tracker dogs also deal with corners and turns. 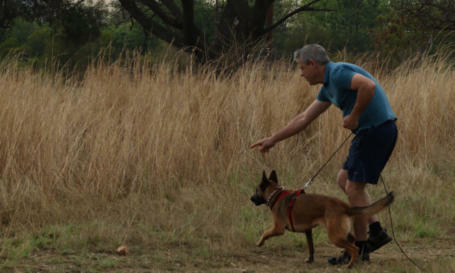 There are also articles which are dropped along the track, which the dog indicates to their handler. All this makes tracking challenging but very enjoyable. 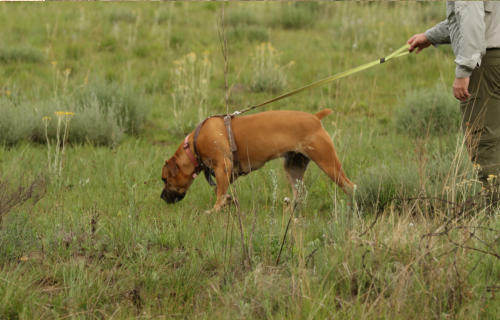 Dogs must have a tracking harness before starting to track. 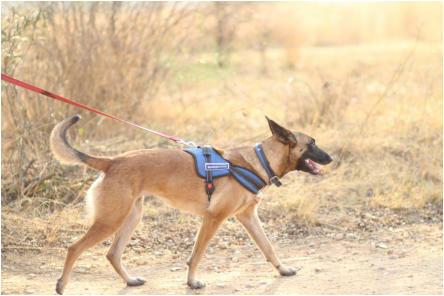 The harness encourages the dog to move forward and removes any pressure on the neck and throat. 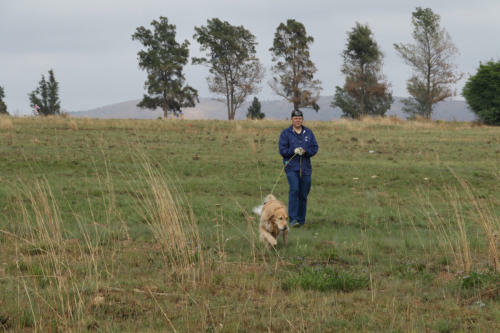 The McKaynine trackers meet on Saturday mornings at an open venue close to our Honeydew premises. The team has achieved many qualifications under the tutelage of master tracker, Steve McClean, and we are exceptionally proud of our tracker dogs! Our Tracking class is always fully booked, but we have a First Timer programme which you can enquire about. This programme allows you to fill in if a regular tracker is unable to make class. You can then decide if tracking is for you and go onto the waiting list. We wish we could accommodate all the requests we get for this class, but this would make the class too big for the type of personalised instruction that tracking requires.